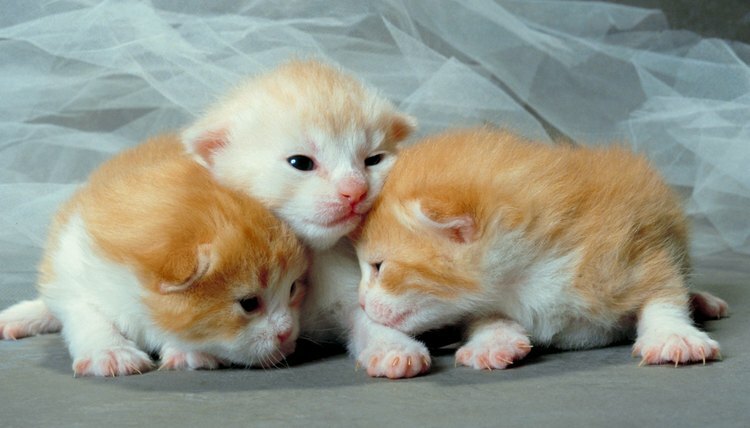 Newborn kittens can experience many health problems, and infections in the eyes are quite common. Infections can occur for many reasons, including getting scratched when vying for nursing positions, or from the cat’s mother licking his bottom, then his eye. Whatever the reason, eye infections can be quite serious and it is important to take care of them quickly. It is common with kittens who have eye infections to have pus coming from their eyes. Pus is a colored, thick discharge that can also have an odor. The eye may also be red, with the third eyelid exposed. Furthermore, if there is a large amount of pus coming from the eye, it may cause the eye to shut. Kittens can also have clear discharges in their eyes, but these aren’t typically serious and can be eliminated by cleaning them. If your kitten has pus coming from her eyes, do not attempt to treat them yourself. The kitten needs antibiotics, which can only be obtained from a veterinarian. If the infection is left untreated, it can eventually spread to the eyeball and socket, which can cause blindness. This is extremely detrimental for feral cats, as they may not be able to find food if they are blind, which can lead to starvation. When you take the kitten to the veterinarian’s, the first goal is to remove the pus from the eye. You will likely also need to do this at home. Use cotton gauze that has been soaked with a sterile eye irrigation solution to dab at the eyes to keep them clean. Try not to wipe the eyes, as you can push the pus back into the eye. The vet will then check to see if the eye has an ulcer on it, which can be caused by a scratch or other irritation. The doctor will prescribe an antibiotic ointment or drops to treat the infection. Depending upon the severity of the infection, the eyes may only need to be treated a few times a day for about a week. If the infection is particularly bad, it may need medication for longer. To apply the eye ointment, it is best to do so coming from behind the cat. Hold your kitty so that its rear end is against your stomach. Hold the eye open with one hand, while using the other to administer the medication. If you are using ointment, draw a line across the eye, being careful not to touch the tip of the applicator to the eye. If you are giving drops, hold the bottle a few centimeters away from the kitten’s face and squeeze the prescribed amount of drops into the eye. If the eye looks worse or isn’t getting any better after a few days, contact your veterinarian again. The sooner you begin treating your kitten’s eye infection, the sooner it can be resolved. If you respond quickly to the problem, the chances of permanent damage lessen.